Allow the sound of your voice to energize your life! SOUNDShifting is an empowering book for anyone who is consciously choosing to create new habits of health, joy and fulfillment in their everyday life. Tryshe Dhevney, sound healing expert, has developed and refined the highly effective toning techniques of SOUNDShifting for more than twenty years. She is an award-winning actor and director and has been honored by the John F. Kennedy Center for the Performing Arts, and praised for her musical collaborations. As a recording artist and authority in the field of vocal sound healing, Tryshe’s work and teaching have been inspired through her own personal healing journey from a potentially fatal illness to complete health and well-being. Her work with sound and body/mind integration is considered groundbreaking and forms the foundation for her weekly seminars and this book. She lives in Tucson, Arizona with her best friend and husband, Tim, and their beloved cat, Calloway. Shipping rate is United States only. Contact tryshe@soundshifting.com directly for international rates. A PDF of this eBook will be emailed to you once your purchase has been finalized. 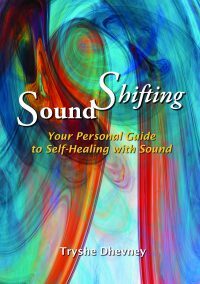 SOUNDShifting – Your Personal Guide to Self-Healing with Sound is a wonderful introduction into the power of using sound for healing. Tryshe Dhevney’s insights, teaching and simple exercises gives the reader an immediate entry into this ancient world of healing. Her gift with sound and voice began first with her personal experience of healing through toning – an authentic initiation and calling into mastery of this healing art. I enthusiastically recommend “SOUNDShifting” and Tryshe Dhevney’s work to anyone with an interest in sound, healing, or a new way of experiencing their relationship with their body. Joan Steuer, President, Chocolate Marketing, LLC. If Shipping Any Product To Hawaii Or Alaska, Distance, Weight And Volume Will Add To Cost…So Call Us At SoundShifting For Rates.